Your people are your most valuable asset. Whether you’re trying to achieve customer centricity, growth or innovation, you must attract, retain and engage your top talent. Employee rewards and recognition programs are one of the most effective tools in creating and sustaining an engaged and productive workforce. Implementing a proper performance-based recognition program that is both meaningful and motivating is imperative to achieving business results. And we can help. 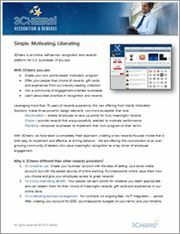 Watch our video to experience the power behind the 3Cheers recognition and rewards platform and begin driving employee engagement through meaningful recognition. 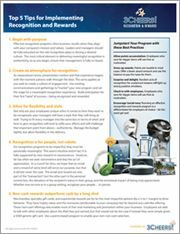 Read our "Top 5 Tips for Implementing Recognition and Rewards" tip sheet to learn best practices for jumpstarting your program. Download our product sheet to better understand how the 3Cheers platform works and understand why 3Cheers is different than other rewards providers. Cultivate a recognition culture by training managers on how to give recognition effectively. 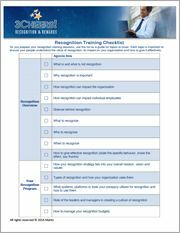 Use our "Recognition Training Checklist" as a discussion guide during training sessions. Download our "Recognition Communications Calendar" to help guide your employee recognition communications plan. Recognize your team using our fun, customizable ecards. Add a personal message and thank your employees for their contributions.